Please call to schedule service and get a "RGA" number for fast turnaround. Wadkin offers cutterhead repairs for damaged heads. Services include dynamic balancing, re-sleeving of hydro-loc heads and general repairs. Our repair service can bring new a life in to worn-out grease gun. OEM replacement parts are used to get your high pressure gun back into service. High precision and standard spindle repair services are available for molders and grinders. 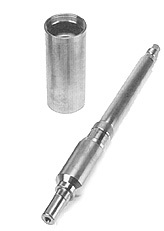 Wadkin specializes in the service of resharpening your helical metal feed roolers (saw tooth design) for most molders. This includes Weinig, Wadkin, SCMI, Diehl and others. This allows you to recognize substantial savings over the purchase of new feed rollers. Some feed rollers are not able to be sharpened. Please note that pricing may vary due to the condition of your rollers. Because we are a feed roller manufacturer, we can fabricate custom rollers to most any size. We can also recover worn feed rollers for moulders, power feeders and other machinery. Custom feed rollers are available on request. Call us to discuss your particular application. Corrugated, HSS, carbide, Williams & Hussey, Belsaw, and others available. Custom templates available also. New replacement knives and resharpening of dull knives is available. Prices are subject to change without notice. All prices are in U.S. Dollars. Wadkin North America, division of Wood Tech Enterprises, Inc. is not responsible for typographical errors.